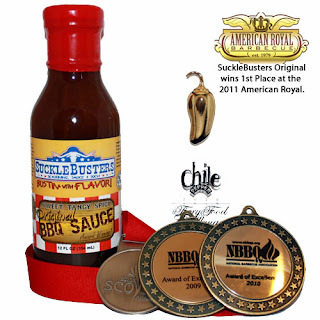 Each of SuckleBuster's BBQ sauces has won numerous awards in some of the nation's biggest and best competitions. Though each is excellent in it's own right, it all started with their original sauce. Few sauces can match the trophy case of SuckleBuster's Original BBQ Sauce. A first place finish at the 2011 American Royal is just one of the top honors this sauce has earned. Like their other varities, the Original recipe is a thin vinegar base. It's sweetened with both brown and white sugar. The sauce also mixes in tomato paste for body, color and favor. The sauce is intially quite sweet. The flavors are generally mild, but there is a detectable amount of smokey spice. It finishes with a great vinegar tang that lingers on the tongue. I used SuckleBuster's BBQ Sauce on pulled pork and BBQ chicken. The sweet and tangy sauce was perfect with the smokey pulled pork. Despite being thin, it also worked incredibly well as a finishing glaze for BBQ chicken. It brushed on smoothly and gave the chicken a beautiful glossy shine. 0 Response to "SuckleBuster's Original BBQ Sauce"